Of all the things we’re launching today — including a notation editor, comments/covers and a new account plan — the thing we’re most excited about is a brand new part of our site: Soundslice Channels. It’s a community for musicians to share musical ideas, to teach and learn from one another. A channel is basically a feed of music notation, synced with video or audio performances. You can follow musicians to get a personal timeline, you can bookmark slices you want to practice, and you can cover the ones you really love. We’ve spent a lot of time making it a seamless experience navigating through a channel. It’s quite fun to browse, and of course you can click on a particular slice to dive into it full-screen. 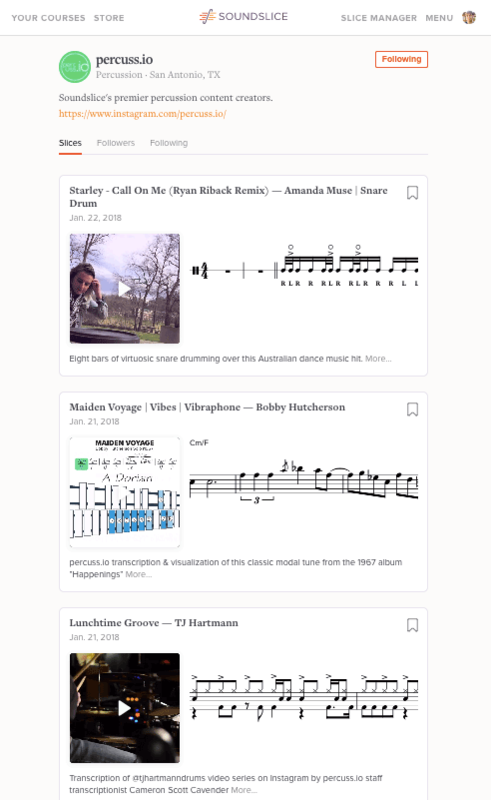 Of course, everything is built around the top-notch Soundslice music-learning tools, letting you slow down audio/video, loop arbitrary sections, navigate by clicking notation, view a visual keyboard/fretboard and more. The idea is to give you a steady stream of new musical ideas, licks and pieces to learn and practice. Why would you want to create a channel? For many reasons — sharing your knowledge, building an audience, connecting with like-minded musicians, promoting your music-education business, or just for the love of music. Speaking as a musician who has been posting to his channel for a few weeks during our beta-testing period: I’ve really enjoyed having the ability to make a curated, beautifully presented selection of musical ideas. Stuff I’ve been working on, stuff I’ve been transcribing, licks I’ve made up. Just having these things all in one place is great — and the fact that it’s contributing to a shared, public repository makes it even greater. Soundslice Channels is completely free — posting, following, bookmarking, commenting, covering. We look forward to seeing what you come up with!